Enough about Mr. T’s short-lived music career and onto mother’s day brunch because you may or may not know that Sunday May 9th 2010 is just around the corner. So you have a dilemma; you need to do something on Sunday. It’s something likely early, something for a group of people, with various tastes, and have it be nice and budget friendly – a Sunday brunch is in order. If you’re a very small group then feel free to go through my site. You can use the sidebar to search by price, location, and rating. However, if you are a slightly larger group and want a big menu, maybe even an all-you-can-eat deal then I have a few places to suggest. These spots are already reviewed and you can look them up: Queen Elizabeth, Chateau Vaudreuil, Porto Vino , and Complex Le Baron. Before we start I should warn you that because Mother’s Day is only once a year and I have no control over where my family goes , I have not been to many of these places. I am familiar with some of them but the goal is to give you some info so you can see what works for you and your family. I contacted a bunch of places I know of and had researched over the years and I will post info on whoever got back to me. These are some suggestions; although, keep in mind there are many spots in the city. The Vieux-Port Steakhouse (39 Rue Saint-Paul Est) has a mother’s day brunch buffet from 9:30am to 3pm and is well priced at $28.95 ($14.95 for kids 10 and under). The food will be a combination of classic continental breakfast where you can get breads, cheeses, muffins, fruit along with some North American stations with some egg dishes, pancakes, waffles French toast. There will also be salad stations, hot meal stations (i.e. 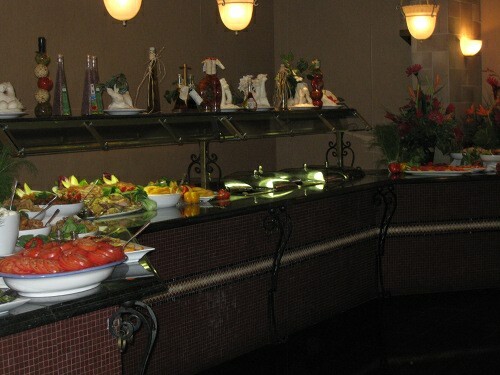 pasta seafood, veggies, rice) and a dessert station. Aix Cuisine du Terroir (11 Côte De La Place D’Armes) has brunch buffet for $38 with 2 services; the first being 11to 11:30 a.m. and the second 1 to 1:30p.m. There is a menu with options ranging from eggs benedict, salads, grilled salmon, duck breast; to give you an idea. There is also an accompanying all you can eat buffet with a variety of choice including: Quebec cheeses, Viennese pastries, smoked salmon, guacamole, shrimps, roasted beef, leg of lamb, crème brûlée and chocolate mouse. Verses (100 Rue Saint-Paul Ouest) has an “URBAN BRUNCH” for 39$ from 11:30 a.m. to 2:30 p.m. An “urban brunch”, according to their menu, includes a mix of classic breakfast dishes with some refined touches like eggs Benedict with sautéed onions and fingerling potatoes, or French toast with maple syrup, stewed apples, and fresh fruit. Not to mention a more lunchy approach like prosciutto cannelloni with grilled vegetables and arugula pesto; fois gras marinated in pineau des charentes and fruit chutney. Hotel St James (355 Rue Saint Jacque) has a $65 set menu where they serve a soup, dates and apples as a starter. With shrimps, clams, melons, kimaca, pomegranate granita and ginger yogourt. Followed by a second service, you will get smoked salmon, lentil and mushroom, ragout, shredded pork and kale or slow roasted beef fillet, soy and coffee glaze, cauliflower spuma and honey mushroom followed by a cheese selection and finished with dessert of ricotta mousse, pomelo, marmalade, pecan foam cookie, ivory szechuan peppercorn and coriander sorbet. This menu is a mouthful and clearly fancy. As we move downtown there is the Delta (777 University) which has its signature rotating dinning room with a view of the city. They have a brunch with two seatings; the first being from 10:30p.m. to 12:30p.m. and the second being from 1:00p.m. to 3:00p.m. The price is $36.95 and it’s half price for kids between 6-12 years old and free for kids under 6. The brunch buffet offerings are huge. They have classic Canadian stations with bacon, egg, ham sausage then you have a regional dish section with pastas, catch-of-the-day salmon, chicken, lamb medallion, mussel, rabbit to name a few. There is also a meat station with roast beef and prime rib. Even after all that there’s a station with some vegetarian options like rice, mixed vegetables and potatoes. They have imported cheese and a sweet table as well. Not bad for under 40 dollars. Next is Restaurant La Coupole (1325 Boulevard René Lévesque Ouest) which has a hot and cold buffet for $30, $15 for kids 8-12 and free for kids under 8. They have various stations; the cold station has lots of salads, couscous, pizza and potatoes. The hot station has grilled shoulder beef, fingerling potatoes, shellfish and seafood paella, asparagus penne pasta, scrambled eggs, French toast, sausage and bacon. There is a dessert station and coffee as well. Lastly is the Sofitel (1155 Sherbrooke West) which has a mother’s day meal. They have a brunch with two seating’s; the first being from 11:00 a.m. and the second being from 1:30p.m. The price is $65 and it’s $35 for kids between 6-12 years old and free for kids under 6. There is an omelette station, multiple eggs benedict selection, salad bar, an impressive station with oysters, scallops, Crab timbale, and beef tartar, they have a meat bar with quail, chicken, lamb and roast beef. Lastly there is a cheese selection as well as dessert section.